MIG welding is one of the more simple welding methods of metal welding as it does not require a high level of skill to achieve results. The process is semi-automatic because an electrode wire and gas are automatically fed through the gun at a user defined speed or pressure when the operator pulls down the trigger, the electronic arc can also be user defined and carried out automatically on operation. MIG is a quick and easy form of welding; it is used often by robotics in automated production lines. MIG however does not offer the best penetration when welding therefore is not the best choice for use on thick plates where a strong weld is required. This process uses active gas shielding, for example when welding low carbon steel in conjunction with argon & Co2 gas shield. 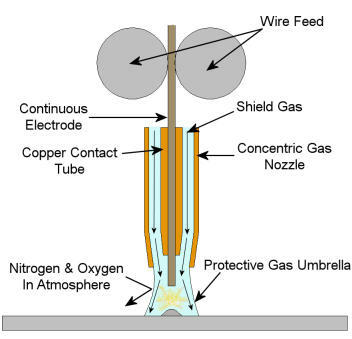 A continuous consumable wire is fed through a suitable torch or gun which is used both as an electrode and a filler, the gun or torch embodies a concentric gas nozzle which channels a protective gas which is usually fed from a separate cylinder out and around the newly formed weld preventing atmospheric contamination. The weld is formed due to the positive electrode (the continuous wire) coming into close contact with the negative electrode of the work piece allowing a large current to flow through the wire causing the tip to heat up beyond its melting point. The type of gas or gas mixtures employed in M.A.G.S. welding varies with the metal being joined. To some extent the gas is chosen to reduce costs, the inert gases being very expensive, but more often the gas is chosen for its effect on the arc characteristics, e.g. burn off rate, type of metal transfer and penetration. These important parameters play a large part in the selection of a shielding gas. Here are some examples of shielding gases and their applications. Supplied in peacock blue cylinders. Supplied in peacock blue cylinders with a black horizontal band around the middle, the oxygen content would also be indicated on the cylinder label. This gas is supplied in liquid form in black cylinders, with a white vertical stripe indicating the siphon tube inside the cylinder. The oxygen content is high and this results in fierce arc characteristics as the oxygen is burnt up and the arc voltage increases. This gas is rarely used today as it has been superseded by gas mixtures such as argon Co2 which combine the advantages of both gases.